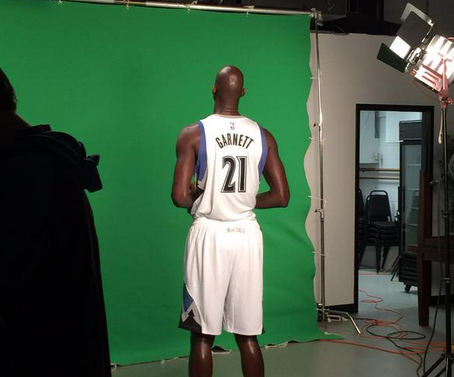 New pictures show Kevin Garnett, the Minnesota Timberwolves legend, back in a No. 21 jersey almost a decade since he last wore it. Garnett, 38, was traded to the T-Wolves from the Brooklyn Nets just prior to the trade deadline last week. He’s scheduled to speak to reporters at 4 p.m. EDT in a live press conference. Garnett was acquired for Thaddeus Young. There are reports that say Garnett, whose contact expires after this season, wants to sign a new, two-year contract with Minnesota. The Timberwolves wanted to get Garnett back to mentor their young core, including rookies Andrew Wiggins and Zach LaVine. Garnett was drafted by Minnesota in the 1995 draft straight out of high school. He played 12 seasons for the team before being traded to the Boston Celtics. He won a championship with Boston before being traded to the Nets in 2012. Garnett is expected to bring his strong work ethic and no-nonsense attitude to Minnesota, a team that has struggled to win much this season while dealing with injuries. “As one of our veteran guys told our young guys yesterday, ‘Hey, listen, when KG walks in the locker room your phones better be tucked away, because if they’re not, they’re going to get thrown in the toilet on game night,'” coach Flip Saunders, who coached Garnett when he previously played for the team, told the Pioneer Press. Besides being a strong influence for the younger players, Garnett wants to eventually purchase the team.